Global sovereign funds and private equity players are showing immense interest in India's commercial real estate segment. The biggest deal ever in the Indian commercial realty segment was sealed last October, when Canadian private equity giant Brookfield Asset Management acquired the entire 4.5 million sq. ft. commercial portfolio of leading domestic builder Hiranandani Group for $1 billion, or Rs6,400 crore. (See Top Beneficiaries.) With this single acquisition, the total private equity investment (PE) in Indian commercial real estate in 2016 rose to $1,997 million, almost twice the $1,154 million pumped in the previous year (see Double Gain). The Hiranandani buyout was Brookfield's second major foray into Indian commercial real estate. In 2014, it had taken over four properties of Unitech Corporate Parks (UCP) in special economic zones and acquired 60 per cent stake in two of its other assets as well for Rs3,500 crore. Later, it acquired the remaining 40 per cent of the two other properties too. Another deal in 2016 saw Dutch pension fund APG invest $450 million in the Xander Group's real estate retail arm in India, Virtuous Retail South Asia. The Xander Group is already developing 66 million sq. ft. in India (including residential projects). Singapore-based developer and investor Ascendas-Singbridge has invested close to $2 billion in the commercial segment. "Even as we speak, our company is actively discussing another deal in one of the top six cities of India," Sanjay Dutt, CEO, India Operations told BT. Sovereign funds of countries such as United Arab Emirates (Abu Dhabi Investment Authority), Qatar (Qatar Investment Authority), Canada (Canada Pension Plan Investment Board) and Singapore (GIC) are all in the hunt, as are global PE giants like KKR, Warburg, Propium PE and Sun Apollo. GIC is said to be close to buying a 40 per cent stake in domestic real estate heavyweight DLF's rental business, but the deal is taking longer than expected due to differences over valuation. However, it is the Blackstone Group that is the biggest PE investor in the commercial segment, having acquired around 31 million sq. ft. - amounting to 5-6 per cent of the cumulative leased office portfolio in the country - with a total investment of $2.2 billion (Rs14,000 crore). 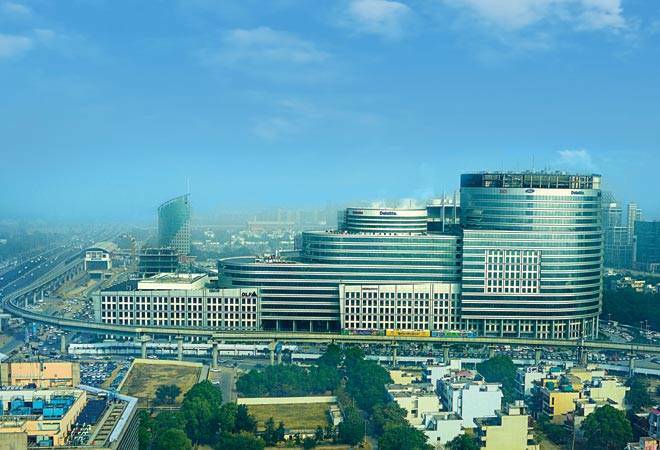 It has displaced DLF as the largest owner of commercial real estate in the country. Blackstone was an early bird, and started picking up choice bits of Indian office space way back in 2010, five years after FDI was first permitted in Indian real estate. "At the time, most global investors, still hit by the global downturn that began in late 2008, were cautious," says a senior industry executive, on condition of anonymity. "It was considered a grave mistake then as demand was skewed towards residential real estate and no one was interested in commercial." Blackstone is having the last laugh. Apart from the top six cities - Bangalore, Hyderabad, Chennai, Pune, Mumbai and Delhi-NCR - foreign investors have also started considering commercial properties in places such as Ahmedabad, Vadodara and Gwalior. "It's not just enquiries - players want to close deals," says Ajay Jain, Exec- utive Director (Investment Ban- king) and Head, Real Estate Group at Centrum Capital, a Mumbai-based financial services firm. What is drawing FDI to Indian commercial realty when the entire sector has been sluggish for years? The key change seems to have been the government decision to lift the various FDI restrictions - relating to minimum capitalisation, floor area developed, exiting, repatriation of profits, and more. "The biggest factor is the amendment to the FDI law in November 2015," says Sid Yog, founder of Xander Group. "Today, there is no threshold for institutional investors acquiring assets in India." The crisis of domestic companies has also helped. "Domestic developers are ready to sell assets to pare debt," says Yog. As of December 2016, for instance, DLF had a net debt of Rs24,000 crore which the GIC deal, if it works out, will bring down considerably. It is for the same reason that Unitech sold to Brookfield. "Earlier, developers used to accumulate land parcels and develop them later. Now to service their debt, they are selling these parcels, but only those that have reasonable yields," says Jain of Centrum Capital. In the last five to seven years, there has also been a change in the mindset of tenants - those leasing property are increasingly considering quality, too, and not just the cost. "Tenants are opting for office spaces which facilitate a high-performance work culture by providing great amenities, including features such as power backup, fire safety and compliance with municipal rules," says Ashish Shah, Chief Operating Officer, Radius Developers. Offices at the iconic Express Towers in Mumbai's Nariman Point area, for example, are commanding higher rentals ever since Blackstone, partnering with Pune-based developer Panchshil Realty, refurbished the building. Finally, India's potential remains immense. "About 40 per cent of the 65-70 million sq. ft. space available for absorption in Asia is in India," says Dutt of Ascendas-Singbridge. "There is strong demand for commercial real estate from sectors such as IT and pharma." Many new economy companies differ from the old is one important aspect. "The demand for office space in India is naturally growing, but the big change among companies, especially in the IT sector, is that they prefer to lease commercial office spaces rather than own properties," says Shah of Radius. "That is why real estate funds are lapping up even existing commercial properties." In 2015, according to real estate consultants Knight Frank, the total office space stock in the top six cities was 560 million sq. ft. The fall in the rupee's exchange value in the past few years has also helped. "Funds have seen rents go up in dollar terms," adds Dutt. 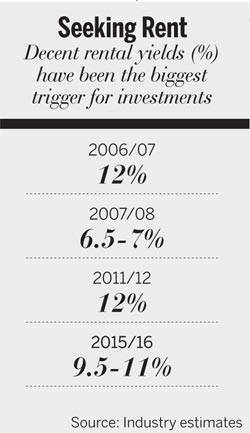 No doubt, capitalisation rates - or rates of return - have fallen from 9.5-11 per cent in 2012/13 to 8.5-10 per cent in 2015/16 (see Seeking Rent), but that is hardly an impediment - the segment is still more lucrative than in other countries. Blackstone, for instance, is rumoured to be earning 12-15 per cent, or Rs1,750-Rs2,100 crore, as annual rental on its Rs14,000 crore investment. Some urban areas no doubt have very little space left for further development - but that only makes demand more acute. "Commercial realty in Mumbai is a classic case of demand-supply mismatch," says Shah of Radius. With no upcoming office spaces and no availability in existing spaces, demand is bound to remain robust." Even the Bandra-Kurla Complex (BKC) area in the city has filled up, with the exception of the Godrej BKC project. The slump in the sector had brought down rentals, which can only climb hereafter. "Prices of commercial property have hit rock bottom and from here they can only go upwards," says Jain. "The risk-reward is in favour of developers, so naturally PE players have become aggressive in acquiring and partnering with developers in commercial real estate." Once their debt problems are sorted out, domestic developers are also likely to make further forays into this segment. House of Hiranandani, for instance - another leading Mumbai developer, and distinct from the Hiranandani Group - recently forayed into commercial realty for the first time. "After years of flat growth, we are seeing a resurfacing of interest in commercial realty, especially in Tier-1 cities," says Neha Hiranandani, Director, House of Hiranandani. "In the next five to six years, 30 per cent of our portfolio will be in the commercial space, including industrial. We will leverage our balance sheet to raise money from the market to build office spaces. We are targeting Mumbai, Pune and Chennai and will pick distressed or incomplete commercial assets." The real estate sector, with its high component of cash deals, was one of the worst affected by last November's demonetisation of Rs500 and Rs1000 notes - and yet its impact on FDI has been more of a speed breaker than a barrier. Dutt of Ascendas-Singbridge also points to the unexpected gains from the step. "There is short-term pain that could last a year but the liquidity crunch has also made commercial property more affordable," he says. "There are no more premiums attached to deals and land is selling at its fair price." He admits that the long-term impact of demonetisation is still unclear. "No one has a clue as to what the impact will be on the economy and no one knows when things will stabilise," he adds. "But global players welcome transparency and proper regulation and in that sense they welcomed demonetisation, too." Foreign funds which have invested will also be looking for exits in due course but are in no hurry. "We have been able to make profitable exits over the decade we have been in India," says Yog of Xander. "Making investments is easy, but one can't be just a passive investor." Real estate investment trusts (REITs) are seen by many as a good option for exits. "There is need for further clarity on taxation in REITs," Yog adds. But an exit will only lead to another investment - the funds are here to stay. "We are long on the India story," says Dutt. "We focus on the long term and try to avoid short -term noises."